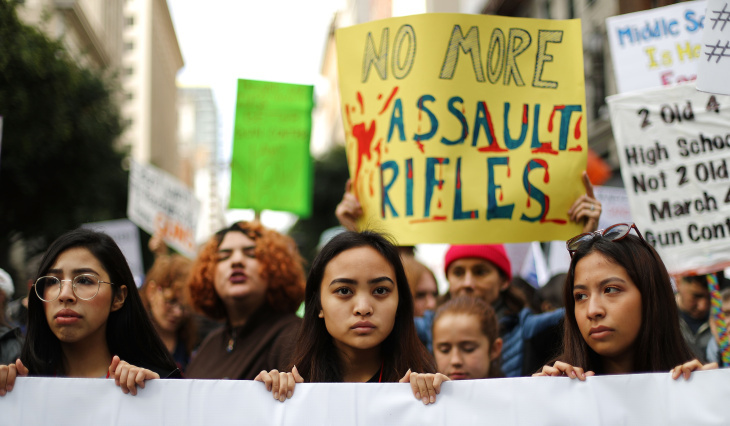 Protesters prepare to march during the March for Our Lives rally on March 24, 2018 in Los Angeles, United States. Protesters chant during the March for Our Lives rally on March 24, 2018 in Los Angeles, United States. 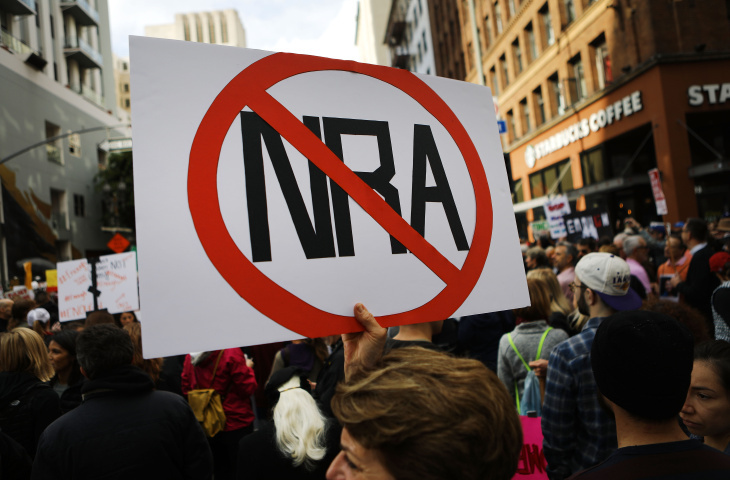 A protester holds an anti-NRA sign during the March for Our Lives rally on March 24, 2018 in Los Angeles, United States. Demonstrators and students march down a street in downtown Los Angeles for the March for Our Lives rally. 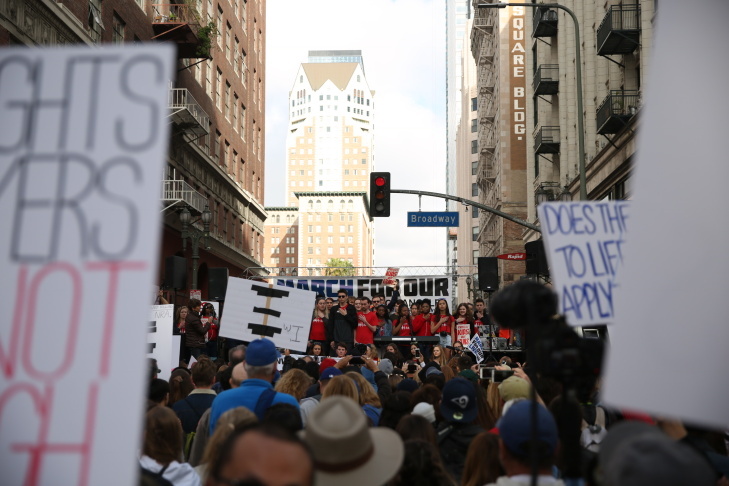 Crowds proceed to walk down a street in downtown Los Angeles for the March for Our Lives rally to protest gun violence, on March 24, 2018. Rider & Nikela on the Metro Red Line, en route to The March for Our Lives event in Downtown L.A. This is their first march. 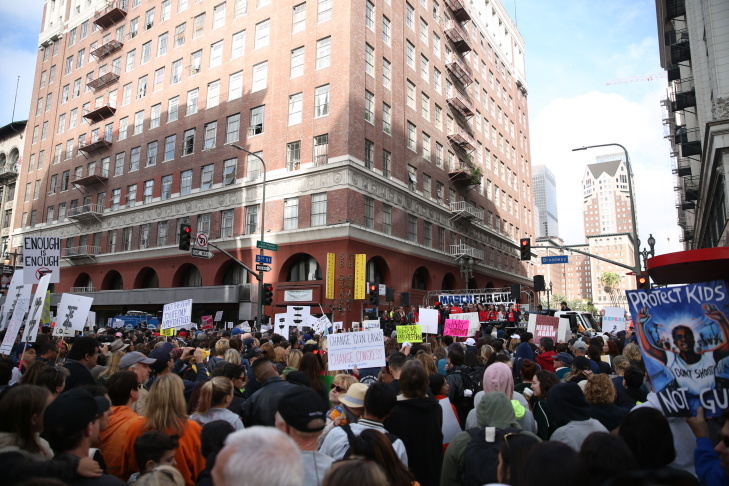 Tens of thousands gathered Saturday in downtown Los Angeles as part of a series of nationwide marches to protest gun violence. The student-led rallies across the country turned out similar crowds and flooded streets with students and their supporters. This was the latest display of frustration by students with the national debate on gun control. Los Angeles students staged a 17-minute walkout to honor the victims lost in the Parkland shooting, along with the rest of the country. Note: This story is no longer being updated. For some participants of the March for Our Lives rally, the civic action brings back memories of other shootings. 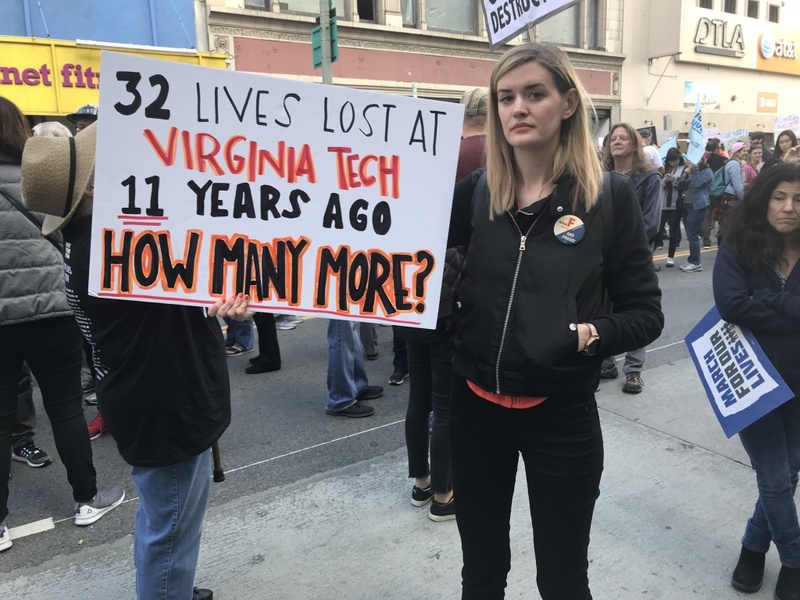 Karin Innocenti was a high school senior in Virginia when news broke that a mass shooting had taken place at Virginia Tech. She soon found out that two of the victims were recent graduates of her high school, as was the shooter. Karin Innocenti holds her sign at the March for Our Lives rally in downtown Los Angeles. She told KPCC she remembers calling for stricter gun laws along with her classmates back then. Innocenti said she’s been frustrated with the lack of action but she thinks this generation of students is energized and has a better shot at changing laws. 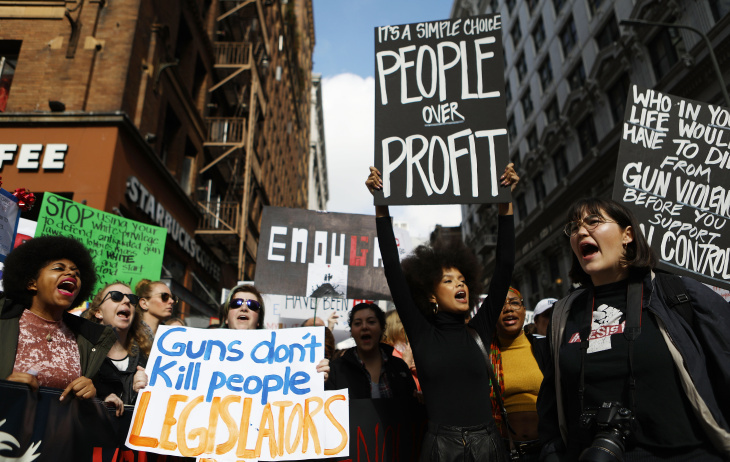 As tens of thousands of people marched through the streets of Los Angeles to demand stricter gun laws in America, a few pro-gun groups chanted against the crowd. A handful of counter-protesters assembled outside Los Angeles police headquarters. One demonstrator, wearing an NRA baseball cap, held a sign with a photo of a handgun that read: "Defend the right!" 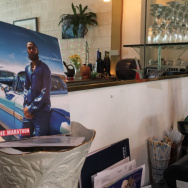 The Los Angeles Police Department said in a tweet that there were no reported incidents so far. 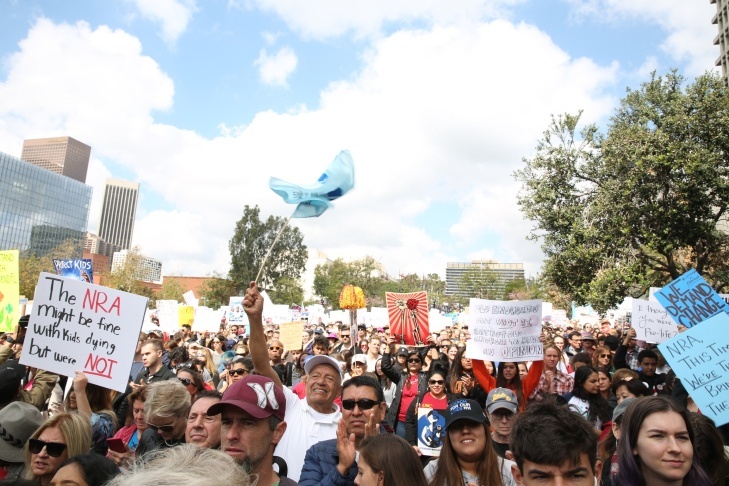 Thousands of demonstrators and students reached Los Angeles City Hall chanting: "What do we want? Gun control." 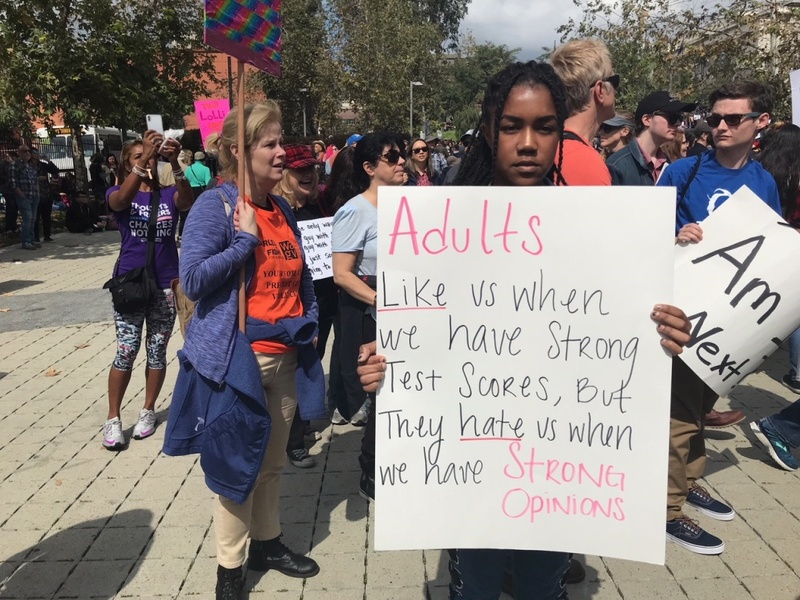 Nyasha Ezekiel, a senior at Palisades High School, took part in The March for Our Lives rally to give a voice to young people. 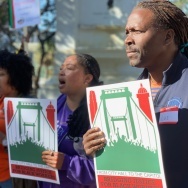 “Teachers and adults strive for us to be our best and to do well in school, but when we try to reach out to our community and fight for our rights, adults don’t always like that," Ezekiel said. Nyasha Ezekiel, a senior at Palisades High Schools, holds up her sign at the March for Our Lives rally in downtown Los Angeles. 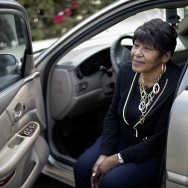 But, she told KPCC some adults are showing their support. She says her school has provided outlets for its students to voice their opinions. 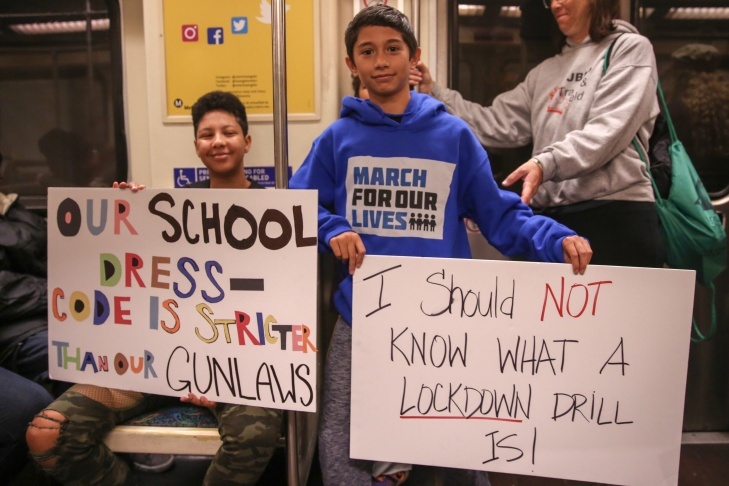 The student-led marches happening across the country have galvanized young people to demand change to the nation’s gun laws. 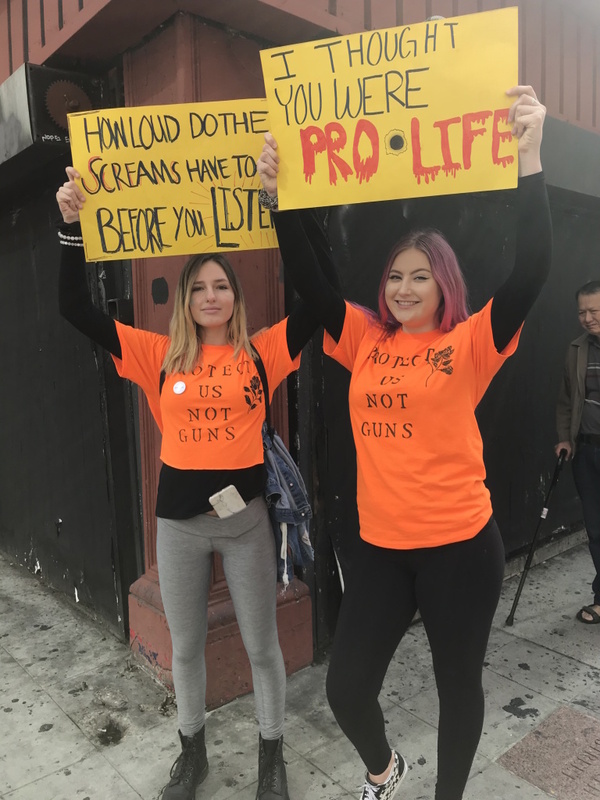 From left to right: Lia Grinsell and Maddy Croall, both students at Westlake High School hold up their signs at the March for Our Lives rally in downtown Los Angeles. Lia Grinsell and Maddy Croall, both students at Westlake High School in Thousand Oaks, told KPCC they’ve experienced three threats of schools shootings within the last three weeks. 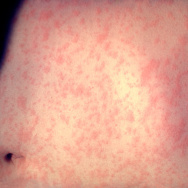 “It’s scary sitting in class and being scared when you hear a door open,” Croall said. Both of them have skipped school out of fear. 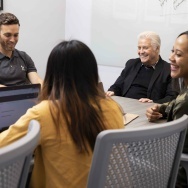 They say going to school in the modern day is a lot different than it used to be. 10:00 A.M.: Parkland shooting survivors march in L.A. Survivors of the mass school shooting in Florida will join the March for Our Lives rally in downtown L.A.
Hayley Licata, 16, is one of those survivors. Licata and her classmate, Mia Freeman, 17, are speaking out for the first time since the shooting during their trip to California. She says the nation's show of support has been tremendous since the February shooting took the lives of 17 classmates and faculty members. "People are showing that they actually do care and that they want to make a change also and be part of the change. And, it's not just the people in Parkland, but everybody across the world," Licata said. 9:30 A.M.: Hundreds gear up in downtown L.A. Hundreds of people are assembling in downtown Los Angeles to demand stricter gun laws in the U.S. after a shooting last month at a Florida high school that left 17 people dead. The main protest was taking place in Washington, D.C., but more than 800 other marches were planned nationwide. The march was set to kick off at 9 a.m. The Los Angeles Police Department said street closures and traffic delays were expected. Below is a list of marches across Los Angeles County. For a full list of marches in Southern California, go here. Burbank - 9 a.m. at Chandler Bike Path, 2500 Chandler Blvd. Downtown L.A. - 9 a.m. at 603 S. Spring St.
Pico Rivera - 10 a.m. at El Rancho High School, 6501 S. Passons Blvd. Long Beach - 10 a.m. at Bixby Park, 130 Cherry Ave.
Santa Monica - 10:30 a.m. at Kyes restaurant, 1518 Montana Ave.
Santa Clarita - 10 a.m. at Marketplace Park, 23811 Newhall Ranch Rd. Lancaster - 10 a.m. at American Heroes Park, 701 W. Kettering St.